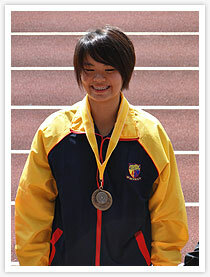 Anglo-Chinese Junior College’s Chan Zhi Xuan on the seventh day (22nd April, Friday) of the 52nd National Inter School Track & Field Championships 2011 took a crack at one of the oldest record still standing, the ‘A’ girls discus, and succeeded. Her new mark of 38.60 meters improved the old record by some 3.12 meters. It previously stood at 35.48 meters established by Asha Mane of YIS back in 1972. Chan Zhi Xuan has finally managed to shatter Asha’s long-standing record which has prevailed for the past 39 years. The 17-year-old who is currently in JC1 has progressed through the division in record style. Last year, competing under Cedar Girls’ colors, Chan Zhi Xuan hurled a distance of 37.94 meters to capture the ‘B’ Girls discus title, and in the process also breaking Wan Lay Chi’s National Schools record of 37.25 meters. This very much means an exciting prospect for the local athletics scene as now we’ve an up and coming junior that’s coming through the ranks.